whiskey in cut-crystal. . . 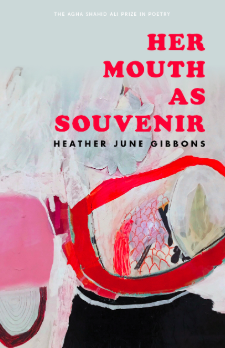 The third and final section of the book features work that is perhaps a little less restive, maybe because so many poems are elegiac. In “Waymark” the now familiar voice yearns to be still for a moment, despite chaos and shifting ground: “Quiet now. Bells in the square ring at strange intervals/and no shadows lengthen. In another country, this medicine/is called Moment and it is very expensive.” And in the beautifully candid “Elegy,” we grieve, along with the speaker, not just an old man’s death but the awful indignities of dying: “gone the edema and the groan/and the diapered man cut down like a stand of Shagbark hickory.” Ultimately Gibbons’ most uncanny gift is for coaxing the reader along on her fevered voyage—as Jericho Brown says in the introduction, “We are stuck journeying―toiling, you might say, the religious sense―until we can fix our eyes on someone who will journey with us.” Gibbons’ is a stirring journey, indeed, with plenty of lyrical detours: a wild ride. Amy Beeder’s third book, And So Wax Was Made & Also Honey, is forthcoming from Tupelo Press. She lives in Albuquerque.